The Ecological and Organic Natural Complexion Illuminator is a soft, creamy concentrate, which unifies and illuminates the complexion. 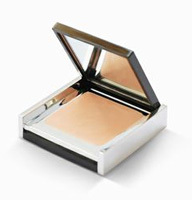 It has a silky, delicate texture that blends beautifully with the skin and gives it a natural glow. Composed of Organic sesame Oil from Fair Trade, beeswax and natural mother of pearl, the natural complexion illuminator is formulated with 100% natural origin ingredients and is ECOCERT Certified. A texture very rich in multi reflection spangles. The gel texture has been specially formulated to provide a long lasting application and an even distribution of the glitter. They come equipt with a professional fine tip applicator, which produces precise, perfect lines. A day look can be transformed in to an evening look in a matter of seconds!